The distance meter is used for accurately determining the distance of an object without contact by way of a laser. The distance meter is frequently used in the industrial sectorand especially with professions relating to construction, such as architecture, surveying, carpentry, masonry, locksmiths, etc. The distance meter is attractive due to its ease of use and its high level of accuracy in the results recorded. 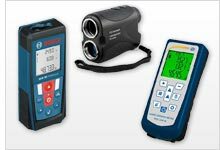 Depending on the model, the distance meter comes with a Leica lens, the world leader in producing optical distance meters. The distance meter can measure, store the readings to memory and determine the surface, the volume or height showing these on their display. There is also a distance meter for fixed mounting for multiple applications in the industrial sector such as position testing, testing coil weight, etc.